Iron deficiency is the world’s most common nutrient deficiency. An estimated 40 percent of the world population suffers from iron-deficiency anemia, a state in which there is a depleted number of red blood cells carrying oxygen to the body. Iron deficiency occurs more often in the developing countries than the undeveloped ones, but is common throughout the world. In the developed countries iron deficiency occurs despite the fact that people eating more than they need, which means that the deficiency is occurring due to eating the wrong foods. This clearly indicates just how nutrient deprived many peoples’ food choices really are. In the developing countries, however, the lack of availability of nutrient rich foods is often the reason, along with illnesses in the digestive tract such as parasites that cause people to lose blood daily. The body values iron tremendously, so-much-so that it might as well be called the the body’s gold. The body actually hoards iron as soon as it gets it, uses it, reuses it, and tries never to gives it up unless it has to. This is different than many other vitamins and minerals that are most often released in the urine when they are in excess. It is also why iron can be toxic if taken too much of. Since every cell in the body has iron, all people lose a bit of it when they shed skin, cut hair, or clip their nails, yet the only significant way to lose iron is blood loss. Eighty percent of the iron in the body is in the blood and so women are the most likely to be deficient in iron are women, the population that loses blood through the menstrual cycle. As such, women should be highly conscious of their iron levels and be aware of slipping into iron deficiency anemia. The most common symptoms of this deficiency include fatigue, sleep disturbance, pain, anxiety, sadness and nausea. In some patients the fatigue may be obvious and disabling, whereas in other patients, especially those who have had their anemia slowly worsen, the symptoms associated with anemia may not be readily apparent. Some people may even consider their symptoms to be related to another condition or “just how most people feel.” Another curious symptom in people who lack iron is pica. People who display pica have a bizarre appetite for non food items, such as clay or ice. Some people have even been known to eat as much as 8 trays of in one day! In children, iron deficiency manifests as irritability, restlessness, and an unwillingness to play, pay attention and can often fall behind their peers at school. It is important to pick up these symptoms early before the fatigue, inactivity and depression begin to exacerbate one another and lead to a downward spiral, which may end up being quite difficult to break. To understand anemia, a brief overview of iron metabolism is crucial. The term anemia means a severe state of iron depletion resulting in low hemoglobin, the molecule within in the blood that iron is found. The iron in hemoglobin is what gives blood its reddish color. When looking at the blood of an iron deficient person under a microscope the red blood cells do not seem all that red any more. The cells are smaller and lighter red than normal because they do not contain the hemoglobin. Hemoglobin is the reason that symptoms such as tiredness and cold are produced because it is what carries oxygen to the cells, which is used during energy production. When there is little oxygen the cells are not able to burn the fuel within the cells and produce as much heat. So how does someone become iron deficient and how do they get it back? If Iron absorption < Iron depletion then = Iron deficiency. Nevertheless, iron deficiency does not mean you are necessarily anemic. It is matter of degree. It takes time to deplete all the iron stores in the body, but once that occurs and the iron deprivation continues then anemia will set in. The bad news is that iron is the most difficult nutrient to restore adequately once deficient. It can take a very long time to restore iron adequacy since all forms of iron are poorly absorbed (2-10%). The best way to get iron is through diet. Women need one and half times more iron then men, which is often harder than it seems because, on average, they eat less than men. The usual iron supplement prescribed for iron deficiency is ferrous sulphate, which is iron bound to sulfur. It is usually handled well by most people except that it often has the side effect of constipation. Other forms of iron that are recently gaining more attention are iron amino acid chelates, such as iron glycinate. These have iron bound to an amino acid. Iron glycinate is supposed to improve the absorption of the iron and its usage by the red blood cells, decreasing the amount that has to be in each pill and thereby producing fewer side effects. Iron supplements should also be taken during meals and with Vitamin C. Vitamin C can triple the amount of iron absorbed when they are consumed concomitantly. Finally, L-Carnitine – studies have correlated L-Carnitine with increased red blood production, increased red blood cell lifespan, improve red blood cell shape, and hematocrit. Historically certain herbs have been used for treating anemias. Scientific research proving their efficacy is not yet available but their safety and historical usage make them candidates for adjunctive treatment to the ones mentioned above. -Alfalfa: used as a tincture, tea or whole in sprouted form. It is alkalizing, detoxifying (especially for the liver), and antifungal. It has been used for colon disorders, anemia, hemorrhaging, diabetes, ulcers, and arthritis. Do not use alfalfa for greater than 3 weeks without consulting a herbalist. -Anise (and star anise): Primarily used for cough, congestion and gas. It has also been used to increase uptake of iron in the stomach. Use 1 teaspoon of crushed seeds per cup of water three time a day. Good sources of iron include: leafy green vegetables such as swiss chard and spinach, proteins such as beef, navy beans, and particularly clams. Iron through food is better absorbed than iron from supplementation. In food iron occurs in two forms, iron that is in meat, poultry and fish which is bound to heme, and iron from plants which is not bound to heme. Heme iron, like the one in meats, is better absorbed than the non-heme iron of plants. Moreover, meat, fish and poultry have something additional called MFP factor. This factor promotes the absorption of iron from other foods eat at the same time. -Marrow plus codonopsis formula – includes milletia, ho-shou-wu codonopsis, astragalus, ligusticum, and rehmannia. This addresses the damage to the “bone marrow” according to Chinese diagnostics, the root of most antiretroviral drug related anemias. -Rehmannia/gan di huang: Animal studies have found this to be helpful in recovery from anemia and arthritis. It also can lower blood sugar levels in diabetes. For anemia, 15 grams of the root is simmered in 500 mL of red wine. -Acupuncture used to “tonify blood” according to Chinese diagnostic techniques dates back thousands of years to help treat anemia. The remedy Calc Phos is a general nutrition tonic. As this tissue salt assists in digestion and assimilation it is excellent after surgery when the digestive system has slowed right down. Calc Phos is also recommended for the treatment of anaemia in conjunction with Ferrum Phos. Despite the clear need for iron in the body, none of the above mentioned symptoms are diagnostic of iron deficiency anemia. A diagnosis can only be reached through a blood test and an evaluation by a physician. Simply basing a decision on symptoms may lead you to believe that you are lacking iron when it may be not be iron deficiency at all. There can be many factors that cause tiredness other than anemia, one of them being as simple as not getting enough exercise. Finally, the toxicity of iron is well known and supplements can be very dangerous. Unabsorbed iron in the colon causes damage to colon cells, which has been linked to colon cancer. Excess iron may also play a role in heart disease and increased risk of infections since bacteria thrive on iron-rich blood. 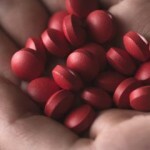 Further, iron supplements are the leading cause of fatal accidental poisonings among children in the United States. The best advise for anyone who feels they may have iron-deficiency is to bring it to the attention of your physician. Furthermore, since iron-deficiency is often a difficult condition to restore, including complimentary therapies may help with a quicker recovery and prevent more invasive measures.